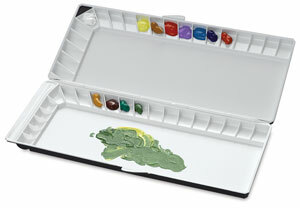 A palette designed by artists for artists! The Mijello Silver Nano is a revolutionary folding palette that can function as a handheld or stationary unit. It features two generous mixing areas and a total of 40 wells, each of which is angled to bring paint toward the artist. The Silver Nano has an anti-bacterial guard to help colors remain fresh during storage. When folded it measures 1"H × 14½"W × 6"D.